Reference number for this case: 10-sep-54-Vicq. Thank you for including this reference number in any correspondence with me regarding this case. It seems that several newspaper publishing about the Dewilde affair also reported that on the same date of September 10, 1954, also at 10:30 p.m., three young men returning from a ball in the village of Vicq had seen a luminosity in the sky. Some say that the course of the thing was in accordance with that given by the witnesses at Onnaing, and that its color was also reddish. In 2016, the "skeptical" ufologist Dominique Caudron, of the Nord, published a web page in which he revisited the Marius Dewilde case to explain that the latter had embroidered his story based on the passage of a meteor seen in the region that night. His Press sources say that in the case of Vicq, three young people including Augustin Ravet, saw the passage of a very bright object coming from the direction of Quarouble. This does not mean that it appeared in the direction of Quarouble but that it seemed to be following an East-West trajectory. Three inspectors of the air police returned to Quarouble (Nord) to hear Mr. Marius Dewilde, the man who "saw" two Martians to the garden gate. The story made by Mr. Dewilde is also confirmed by the testimonies of several people in the area. In Onnaing, a young man, Mr. Edmond Auverlot, and a pensioner, Mr Hublard, saw, at 10:30 p.m., the time indicated by M. Dewilde, saw a red light moving in the sky. The same light was seen from Vicq by three young people coming out of a ball. French ufologist Aimé Michel notes that on september 10, in Vicq, three young people coming out of a ballroom saw a red glow moving in the sky seemingly coming from the direction of Quarouble. He specifies that the sighting was discovered on September 11 by unspecified investigators, who wanted to find out whether other people saw something similar to the famous observation by Marius Dewilde in Quarouble. 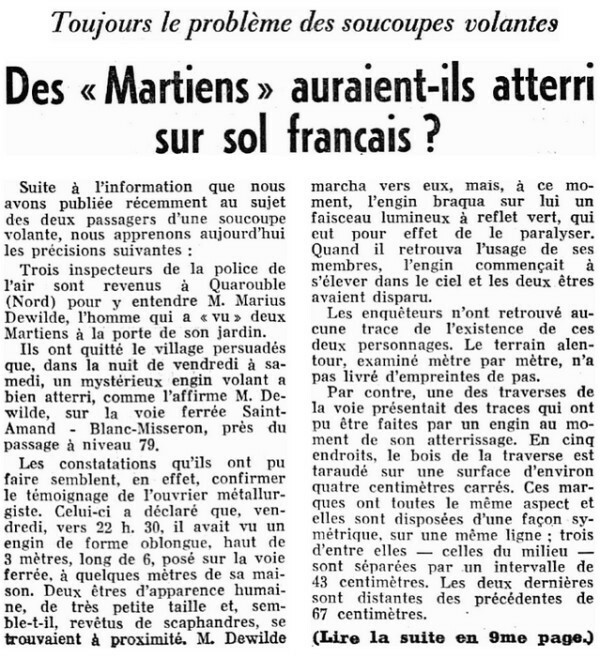 The two French authors and ufologists, while writing about the famous alleged encounter by Marius Dewilde, report that two other observations lend credibility to that story. One of the two other observation, they say, was of a gleam similar to that seen in the other of these two sightings, the sighting in Onnaing this same day. In the second sighting, the same gleam was seen by three young people coming out of a ball in Vicq. 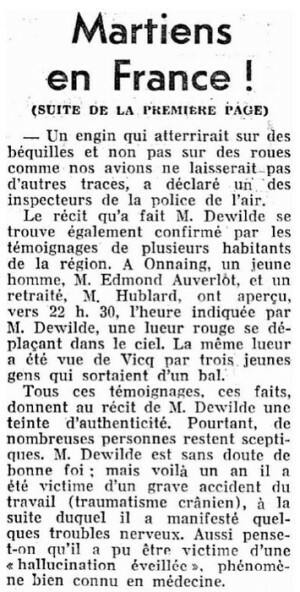 The author indicates that Mr. Dewilde's visual testimony of an in-flight UFO was confirmed by two other visual testimonies of glowing red devices traveling in the sky around 10:30 p.m., one of which was in Vicq at 2 kilometers north-west of Quarouble, by several people. Rene Pacaut indicates that at the same hour as the sighting in Onnaing that day, the same phenomenon as that observed in Onnaing was seen by young people at the exit of a ball. The two authors indicate that on September 10, 1954, at 10:30 P.M., in Vicq, three witnesses observed a red gleam coming from Quarouble. That same Friday evening (the lOth) west of Paris, at 10:00 p.m., a UFO report was made at Villeneuve-en-Chevrie. A brilliant oval object was spotted by a Mme. Traussier. 62. More important then that however, were two reports that lent support to the Dewilde case. At the village of Onnain [sic], just to the south of Quarouble, two people saw a red blob in the sky coming from the direction of Quarouble at approximately 10:30 p.m., the time of the supposed "encounter with two creatures" behind Dewilde's home. The witnesses at Onnain were M. Edmond Auverlot and a M. Hublard. Moveover, some Frenchmen returning from a dance at the village of Vicq sighted a reddish luninosity in the air when they were 1/2 mile from Quarouble. The time was: 10:30 p.m. The course of the UFO as reported by these men agreed with that given by the witnesses at Onnaing. 63. Reference 63 is given as "Michel, Aimé, 'Flying Saucers and the Straight Line Mystery', page 47. The author indicates that the story by Mr. Dewilde is confirmed by several inhabitants of the region: the same light was seen from Vicq by three young men. This ufologist indicates that on September 10, 1954, at approximately 10:30 p.m., in Vicq, in the Nord, according to the book M.O.C. by Aimé Michel on page 63, three young people have saw a red gleam in the sky coming from the direction of Quarouble which is with 800 meters of Vicq. Three young men saw at around 10:30 pm a red glow in the sky coming from the direction of Quarouble which is 800 meters from Vicq. Luc Chastan indicates that in the Nord in Vicq on September 10, 1954 at 22:30 "Three witnesses observed a red gleam coming from Quarouble". 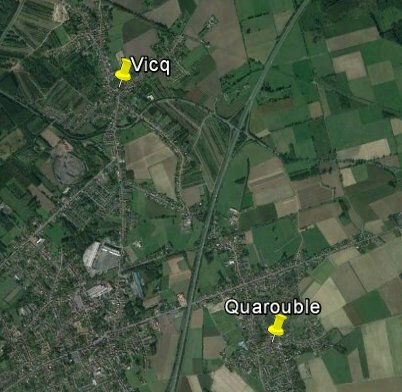 Vicq is only at 2.6 km from Quarouble, in straight line from center to center. [---] Article in the national newspaper France-Soir, Paris, France, September 15, 1954. [fa1] Article in the foreign newspaper Feuille d'Avis, Neuchâtel, Switzerland, pages 1,9, September 16, 1954. [am1] "Mystérieux Objets Célestes", book by Aimé Michel, Seghers publisher, France, page 66, 1977. [gl1] "Face Aux Extraterrestres", book by Charles Garreau et Raymond Lavier, Jean-Pierre Delarge publisher, France, page 137, 1975. [hd1] "Premières Enquêtes sur les Humanoïdes Extraterrestres", book by "Henry Durrant", Robert Laffont publisher, France, page 34, 1977. [rp1] "Ils Ont Rencontré des Extraterrestres", book by René Pacaut, Alain Lefeuvre publisher, France, page 51, 1978. [lg1] "UFOs: A History - 1954 - September", monography by Loren Gross, USA, page 20, 1991. [ab1] "The Encyclopedia of Alien encounters", book by Alan Baker, Virgin Books publishers, U-K., page 275, 1999. 0.1 Patrick Gross November 23, 2007 First published. 1.1 Patrick Gross July 4, 2010 Addition [ab1]. 1.3 Patrick Gross October 17, 2016 Addition [fa1]. 1.4 Patrick Gross January 5, 2017. Addition [ub1]. 1.5 Patrick Gross 28 janvier 2017. Additions [hd1], [lg1], [gr1], [dc1]. Addition of the Summary. Explanations changed, were "Not looked for yet."